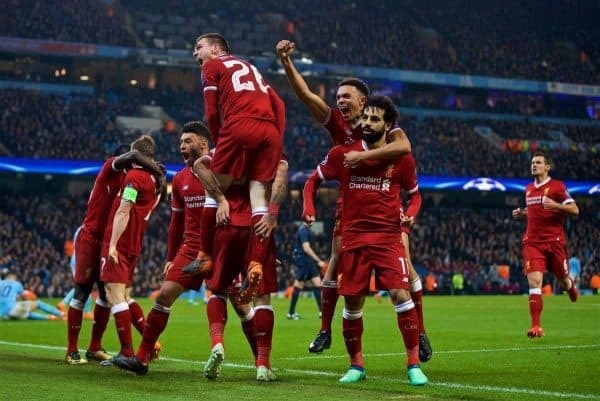 Liverpool edged Champions League dreams a step closer to reality after reaching the semi-finals with a magnificent 2-1 win at Man City. 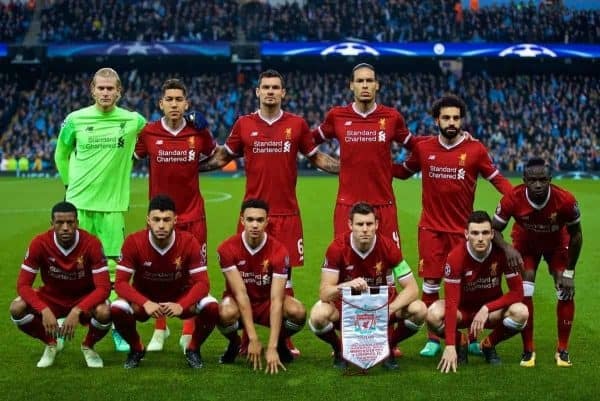 Having roared into a 3-0 first-leg lead with one of the finest European performances produced by a Liverpool side, the Reds arrived in Manchester looking to finish the job. After rotating for the Merseyside derby, Jurgen Klopp restored his first-choice side making one enforced change from the first leg, with Gini Wijnaldum in for the banned Jordan Henderson. Crucially, this meant Mohamed Salah was back after a groin injury to provide a big boost, while Trent Alexander-Arnold, Andy Robertson, Alex Oxlade-Chamberlain and Roberto Firmino all started after derby-day rests. Liverpool had never been eliminated from European competition after winning 3-0 in the first leg, but Klopp’s side knew only another clinical display would be enough to seal progression. Klopp warned his side to brace for the City “thunderstorm” but at the same time knew scoring just once would leave City facing the almost-impossible needing five goals. But Liverpool showed little of it as Pep Guardiola’s all-out attack lineup immediately paid off as the hosts scored just two minutes in to punish a careless opening from the nervous Reds. A bad decision from Loris Karius to throw to the under pressure Virgil van Dijk resulted in possession being lost, and Raheem Sterling raced clear to square for Gabriel Jesus who finished. It was a nightmare start and game on, but Liverpool regrouped while also showing signs they could find the gaps in City’s back line. The next chance came City’s way though through the Sterling-Jesus combination again, but the latter couldn’t turn home the former’s cross. The hosts continued to overrun the Reds and fire in crosses and pot-shots from all angles, keeping Karius busy on return to his former club. The Reds struggled to enjoy sustained possession and chances to break were limited in the opening half-hour, prompting Klopp to move Salah central. But City came within a lick of paint from making it 2-0 five minutes before half-time, but Bernardo Silva saw his shot cannon back off the post. The hosts thought they did have a second just moments later when Sane bundled home from close range, but thankfully the flag went up to preserve the two-goal cushion. After spending the entire half on the back foot, the Reds almost grabbed the priceless away goal on the stroke of half-time, but Oxlade-Chamberlain couldn’t keep his shot down from a tight angle after side-stepping Ederson. 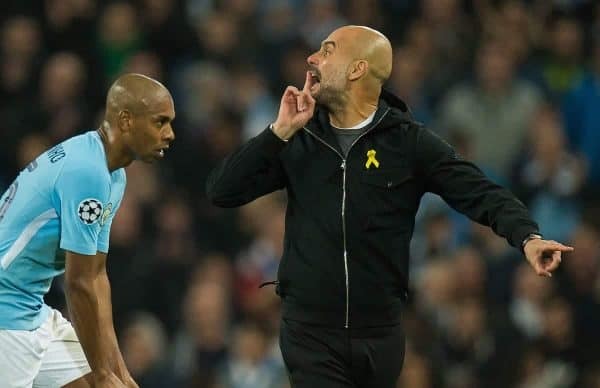 The first-half drama hadn’t finished yet though, and Guardiola was sent to the stands during the break after venting his anger over Sane’s ruled out goal. The Reds were much improved after the break, much more controlled in possession and in turn looking more threatening on the break. And Liverpool’s extra courage paid off 12 minutes into the second period as the Reds grabbed the all-important tie-ending away goal. Man-of-the-moment Salah—who else?—delivered it, showing incredible composure to produce a sublime chip finish after great work from Sadio Mane, sparking wild celebrations in front of the travelling Kop. Klopp’s side visibly grew in confidence, and as spaces opened up, looked capable of scoring a killer second to end the tie. At the same time Salah’s strike completely knocked the stuffing out of Guardiola’s men, who refused to lie down but looked like a side who knew there was no way back. And with 13 minutes to go the job was completed as Firmino wrapped up the tie once and for all, winning the ball back himself in trademark fashion before sliding into the far corner. It saw the Brazilian equal a club record set by Dean Saunders of nine goals in a European season. The travelling Kop was well and truly in party mood, with “Allez, Allez, Allez” ringing out from the away end. City kept pushing and had a second effort of the night ruled out for offside—not that it mattered—when substitute Ilkay Gundogan rolled in. 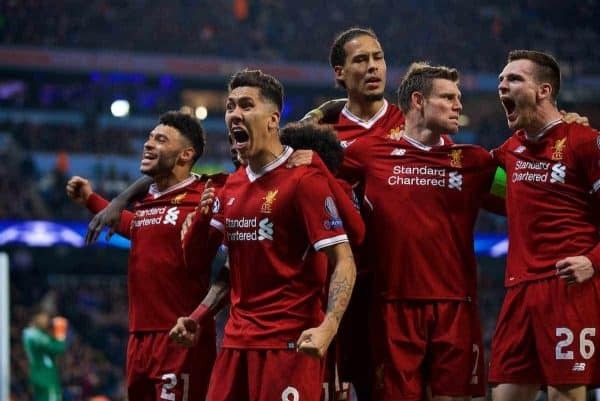 But that was the hosts last push, and Liverpool saw out the closing stages to reach the semi-finals of the competition for the first time in a decade. The remarkable European adventure rolls on.